I have been entranced by this image since I first saw it, some time ago now, and by many other wonderful photographs of the Wakhan Kyrgyz taken by Matthieu Paley on his various expeditions to this most isolated part of Earth. This group of nomadic Kyrgyz used to roam across central Asia, until political divisions of the land they inhabited forced them into the Wakhan Corridor, a narrow strip high on a plateau in extreme north-eastern Afghanistan's Pamir Mountains, days' journey from any other settlement. With drastically limited access to healthcare, education and widespread opium addiction, the population of around 1000 continues to decline due to emigration and general hardship. A third of Kyrgyz women in the Wakhan will die in childbirth, while a similar proportion of children will not live beyond five years. Happily, by the time this picture was taken, this little girl had made it to seven. Her name is Marbet, and her bright-red cheeks are a result of watching over sheep for hours in the harsh cold. She wears the red headcloth and six braids of unmarried girls; when she marries she will join her husband's family, possibly far from her own, don the white headcloth of a wife and wear fewer braids, hung with silver ornaments. A Kyrgyz woman will cost any potential suitor 100 sheep, this animal being their basic unit of currency. A yak is worth around 10 sheep, a well-bred horse 50. A camel is more valuable than any. 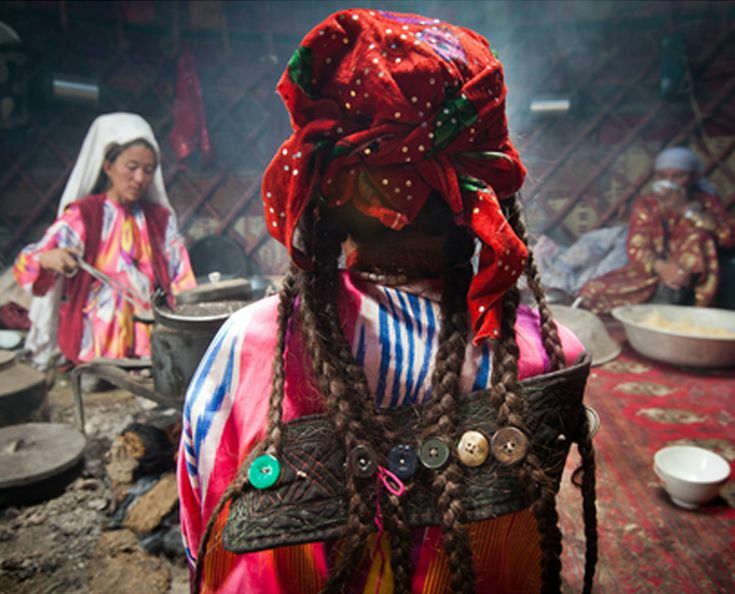 While Kyrgyz men dress very sombrely, their women — and the interiors of their yurts — are lavishly decorated in richly patterned cloths primarily of red. The women also adorn themselves with a variety of items either intended as jewellery or repurposed as such — multiple necklaces, ring and brcaelets; buttons, watches, coins, keys, seashells, even nail clippers are hung about them as decorative additions. All images in this post are copyright Matthieu Paley/National Geographic.